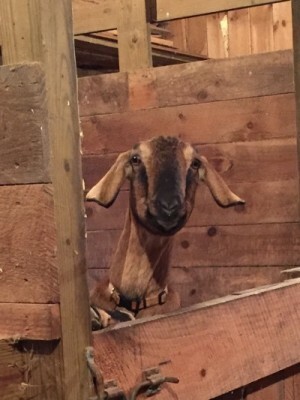 View From My Window – Got Goats? We are often asked if we have goats. The answer is yes we do, three. Although we haven’t milked our own goats for some time. Many years ago, I gave a friend (who had a dairy farm) two goats. She fell in love with goats and eventually had her own herd and we were buying goat milk from her instead of milking our own. It is an arrangement that has worked out well for both of us. So why do we still have goats? They are our pets. If you think you would like to keep goats there are a few things you should know. Goats are very social animals and should always be kept with at least one other goat friend. Contrary to their reputation they are really very picky eaters. Although they do like to eat anything you have planted, like raspberries, blueberries and roses! They don’t eat tin cans or anything like that. My goats won’t eat their treats if the pony (Caddy) has touched it. They won’t eat all the hay I feed them either, they pick out what they like and leave the rest for Caddy to clean up. They are funny creatures and I love to watch them playing out in the field. They are pretty adept at standing on their hind legs to reach leaves on trees and playing with each other and butting heads. Goats are also very good escape artists so good fences are a must. They are terribly curious creatures and are prone to getting into trouble because of it. They will bond to their caretakers and will want you to come visit them, hopefully with treats, every time you go outside. I hear them calling to me every time I go out and if they see me heading in without coming to see them they complain very loudly to let me know. Our goat Allie is my favorite. When we are grooming Caddy she will come and get in the way so I will groom her too. She always makes me smile. Posted by Maryclaire Mayes on Thursday, February 25th, 2016 at 10:10 and is filed under General.